The Angriest: Riverdale: "The River's Edge"
In the all-American small town of Riverdale, the community reels from the disappearance on the river of popular high schooler Jason Blossom. 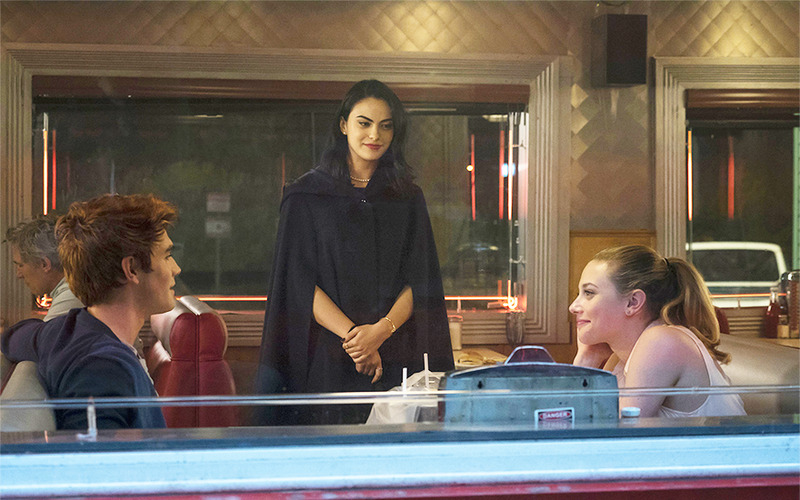 As school returns troubled teen Archie Andrews (KJ Apa) finds himself wedged between classmates Veronica Lodge (Camila Mendes) and Betty Cooper (Lili Reinhart), while his father Fred (Luke Perry) and Veronica's mother Hermione (Marisol Nichols) reveal a past connection. Everything old becomes new again, and given the huge success that the American TV network the CW has enjoyed with its growing range of DC Comics adaptations it is little surprise that they might expand their focus to adapting other popular slices of comic book culture. Riverdale is an update of the Archie comics. They have recently enjoyed a widely acclaimed revival in print, and so it is unsurprising that they would also now make a jump to live-action television. It is worth noting from the outset that as a child I was completely indifferent to Archie. I never enjoyed the comics, to the extent of barely reading them, and certainly it left me fairly disinterested in reading the recent revival titles. I wonder if that indifference is what made this pilot episode grate so harshly: the characters simply do not feel like real people, and more often than not I found myself struggling to engage with their secrets and problems. In fact if anything I gained a sense that everyone involved in making the series was trying a little too hard: Archie comes back to school following a secret love affair with his music teacher, for example, and it felt more than a little tacky and dubious. The episode seems to struggle trying to be three different television dramas at once. Firstly it apes the bright, colourful aesthetic of the classic comic book incarnation, which gives it a rather heightened and exaggerated look. Secondly it is trying to replicate the angsty teen appeal of classic American teen melodramas like Beverly Hills 90210, Party of Five and Dawson's Creek. At the same time it is also liberally copying the unsettling small-town mystery of Twin Peaks. It clearly wants the audience to understand it is copying these shows knowingly, since its cast includes former stars of both 90210 (Luke Perry) and Twin Peaks (Madchen Amick). With too many creative directions at once, however, it seems to struggle to identify an identity of its own. The cast are the series' strongest asset. It might be easy to mock Luke Perry, but he's actually rather naturalistic and effective as Archie's dad. Similarly both Camila Mendes and Lili Reinhart do an admirable job walking the tightrope between comic book caricatures and properly realised and believable characters. As Archie Andrews, KJ Apa is much less accomplished, however he seems to lack the scripting to really enable him to portray anything particularly realistic: all he has is sleazy melodrama and stereotypes. "The River's Edge" is watchable, but also weirdly jumpy and nervous. Hopefully future episodes will see the creative team settle down a little, trust their material more, and find a path to establishing the series' own identity. There is potential here for a solid teen drama, but right now it feels patchy as all hell.